Quite often I want to copy from a particular web page or a document from a certain section of text. Formatting, and images are not only superfluous, but in most cases, rather disturbing, I really want to continue to use only the text. Unfortunately there are very few applications built-in functionality to paste only the plain text section. 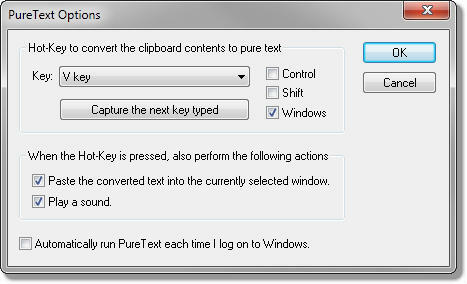 PureText is a small utility for Windows that allows the user to paste the contents of the Clipboard as plain text. Any formatting of the text is removed. PureText makes this simple by adding a new Windows hot-key (default is WINDOWS+V) that allows you to paste text to any application without formatting. pure text can define an alternate shortcut to paste the clipboard and converts the content in normal plain text, without any formatting. After running PureText.exe, you will see a “PT” tray icon appear near the clock on your task bar. You can click on this icon to remove formatting from the text that is currently on the clipboard. You can right-click on the icon to display a menu with more options. The easiest way to use PureText is to simply use its hot-key to paste text instead of using the standard CTRL+V hot-key that is built into most Windows applications.